It’s cold, and the backseat of the car has only warmed enough to keep my breath from showing. Through the window I watch the leafless trees and the bare ground along the road brighten momentarily in the swing of the headlights. Nat King Cole’s version of “The Christmas Song” plays softly through the stereo, and I feel sad. This is not a particular memory, but a synthesis of many Christmas nights’ ending, riding home after a long day of receiving presents in stages – the giddy lode dynamited at daybreak after a long night trying to sleep to make morning suddenly come, then the more patient tapping of lesser seams from grandparents and aunts and uncles, until finally the mine gives out, and there is just the bare tunnel of the drive home lit by the jostling headlights of my father’s car. They say that prizefighters experience an unexpected comedown in victory at the end of the bout, that once the adrenaline drains the channel carved by months of training empties out into a vast, blank delta. Imagine that during their training they listened only to their walkout song, and this is how I felt as a child hearing Christmas songs as Christmas ended – the background to weeks of looking forward suddenly become proof that those weeks have passed. What to look forward to now? I only sensed this as a child, but since that time of the memory of riding home in a cold car listening to “The Christmas Song”, Christmas music has made me sad, a premonition that all longed for moments will pass. The juxtaposition of images like that in a Haiku, or classical Chinese poetry, incoherent in painting a picture, but eloquent in feeling. 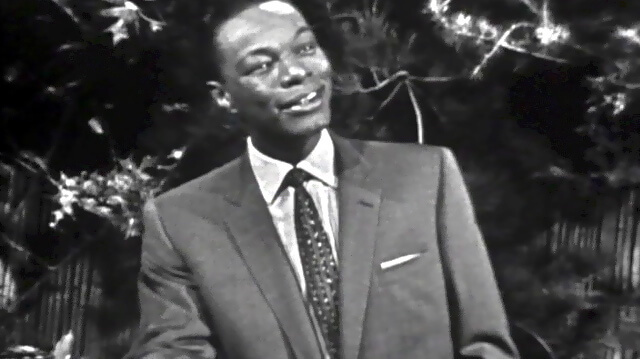 Nat King Cole sings warmly through the chill dark that it’s been said, many times, many ways, but still, Merry Christmas. This entry was posted in Featured, Non-fiction and tagged Cars, Christmas, Dark, Haiku, Nat King Cole, Poetry, Sadness. Bookmark the permalink.